This suede-covered wall sculpture is framed in white nappa. The interaction between colors and shapes makes it a decorative piece based on pure geometry, where abstraction and figuration create formal structures that allow color to dominate. 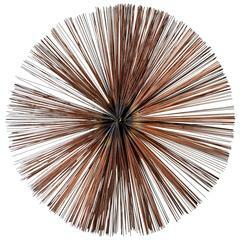 This artwork is a great decorative piece able to create a connection between abstraction and figuration, mixing space-age design and tribal art. The fluid forms are covered in suede, introducing a novel material in the field of wall decorations. Giobagnara: A brand that is distinctive for elegantly designed creations that express luxury without ostentation, available in an uncommon and virtually limitless color palette of leathers and suede, and crafted to the highest standards using both traditional know-how and leading-edge technology. This approach to tradition and modernity led Giorgio Bagnara to experiment: he constantly pushes technical limits in his quest for objects that are both beautiful and relevant, and in doing so relies on the skills of rhe company's craftspeople. Very quickly, Giobagnara became renowned for its expertise, and its founder became a partner of choice for a large number of interior decorators and yacht and jet designers who called upon his know-how for special commissions. Stephane Parmentier: The interior architect and designer Stéphane Parmentier began his career working for Karl Lagerfeld before deciding to devote himself to architecture full-time in 2002. 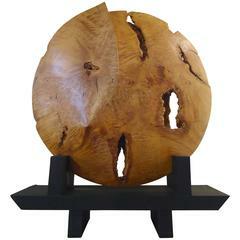 Since then, he has created and developed numerous projects for an international clientele attuned to his style of luxurious simplicity. The homes and objects he designs reveal a vision that is deeply anchored in a modern everyday lifestyle. Inspired by classical Greco-Roman antiquity, the beauty of the Puglian landscape, the restraint of the Japanese aesthetic, and a desire to focus on the essential, he cultivates elegant asceticism by associating noble materials with subtly graphic lines. Vintage blue and white ceramic wall decorative fish mold. 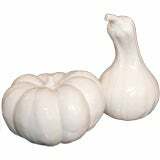 Size: 12.5 x 11 x 2 H.
White ceramic Italian decorative vegetables. Brush brass with polished chrome metal strips, swirled into a handsome decoration. (Please confirm item location - NY or NJ - with dealer).